The Lamb Brand 3 Colour Quinoa is so called since it comes in all three colours: white, red and black. Its a blend of fluffy white, nutty red and crunchy black quinoa. It is also called Rainbow Quinoa or Quinoa Blend. 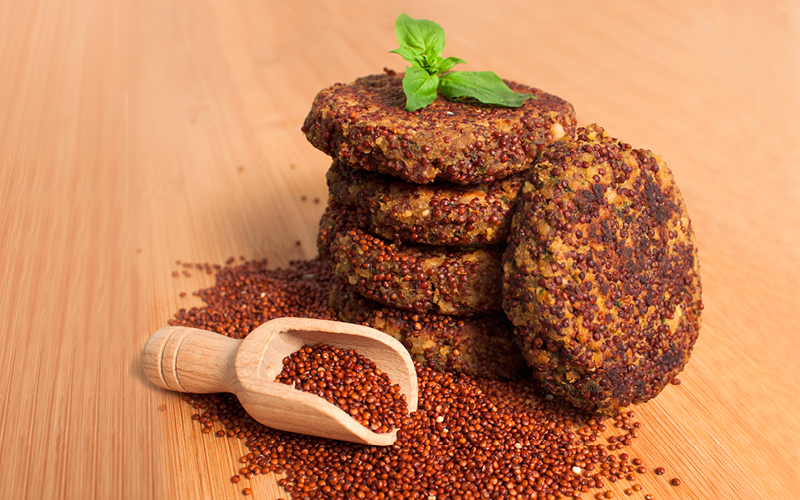 Black Quinoa has more of an earthy flavour and is also slightly sweeter than white quinoa. Click here to follow our Stir Fry Quinoa Recipe. This recipe can be also found at the back of Lamb Brand 3 Colour Quinoa Packet. Lamb Brand Quinoa Red Quinoa has a richer taste, crunchier texture and somewhat nuttier in flavour when compared to white quinoa. It is commonly used for cold salads, as it holds its shape better during cooking. 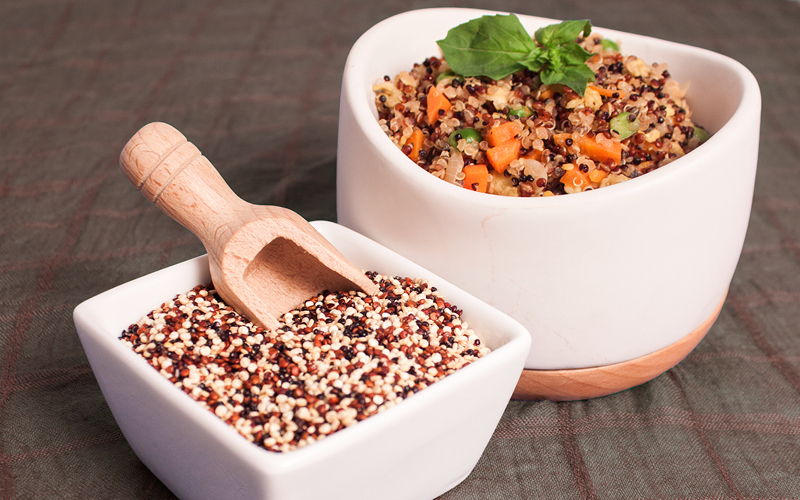 Click here to follow our Red Quinoa Recipe. This recipe can be also found at the back of Lamb Brand Red Quinoa Packet. Lamb Brand White Quinoa is the commonly used and is more of a tan colour rather than white. White quinoa has the most delicate taste and lightest texture and it cooks up a bit fluffier than other types of quinoa. Because of its fluffy texture and milder flavour, white quinoa works well as a substitute for rice in many dishes. 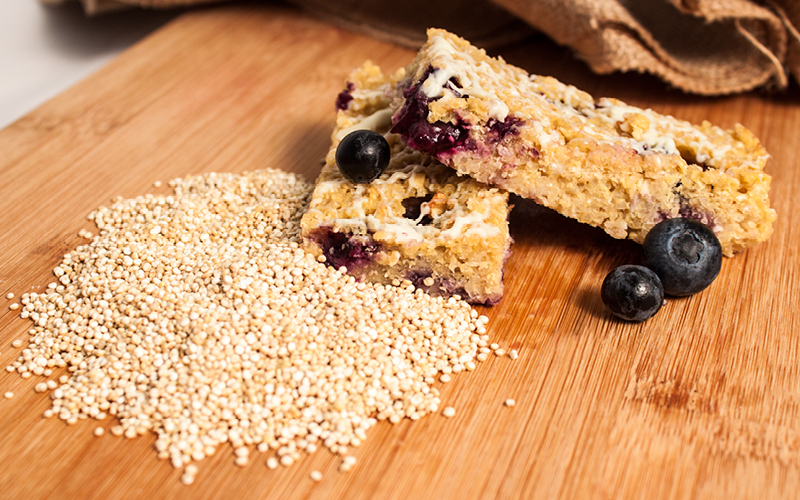 Click here to follow our Blueberry Quinoa Breakfast Bars Recipe. This recipe can be also found at the back of Lamb Brand White Quinoa Packet. Hearty and delicious this Bulgur and Quinoa Blend is excellent served either as a side dish, or in soups, stir-fry, pilafs or salads. This natural food blend forms the basis of healthy living. Lamb Brand Bulgur & Quinoa Blend is a delicious and nutritious mix of grains and seeds. It is extremely versatile and a great alternative to any couscous, rice or pasta. Will add some extra fibre and protein to your salad if used instead of rice. This well selected blend can also be added to a stuffing mix. 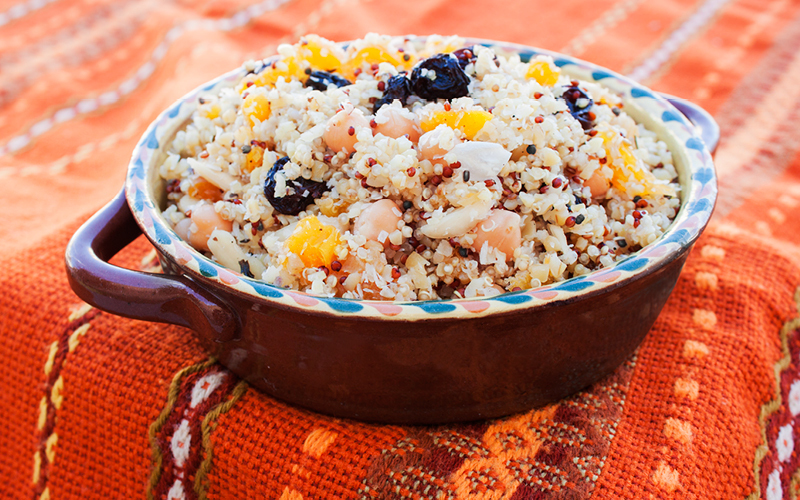 Click here to follow our Fruity Vegetarian Bulgur & Quinoa Salad Recipe. This recipe can be also found at the back of Lamb Brand Bulgur & Quinoa Blend Packet. Oats are the seeds of a grass, Avena sativa, which has been cultivated for thousands of years. They are extremely high in fibre, especially when eaten whole, and they contain a number of other useful vitamins and minerals. Oats are a good source of protein, calcium, fibre, and vitamin E, among many other nutritional benefits. 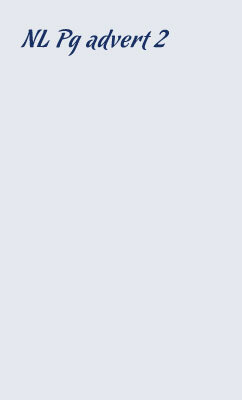 They are an excellent dietary supplement. One of the traditional uses of oats is in oatmeal, a dish made by cooking oats with water, milk, or another liquid to soften them, and oats are also used in baking and mixed-grain cereals. Some people like to use oat flakes as a breakfast cereal, heating them and mixing them with an assortment of ingredients. They can also be added to baked goods like scones, muffins, cookies, and bread, creating additional texture and adding to the nutritional value of these foods. Some people also mix them in with granola, muesli, and other cold breakfast cereal mixes. Oat flakes can also be added to pancakes. Technically, oat flakes can be eaten straight out of the box, although they may not be very exciting in this form. When oat flakes are made, whole oats are steamed to soften them and then they are rolled out to flatten them. The flattened oats are then flaked into small pieces of material which will cook very quickly while retaining the nutritional value of whole oats. One of the big disadvantages to whole oats is that they can take a long time to cook; flakes cut down on the cooking time, turning the healthy oat into a convenience food. 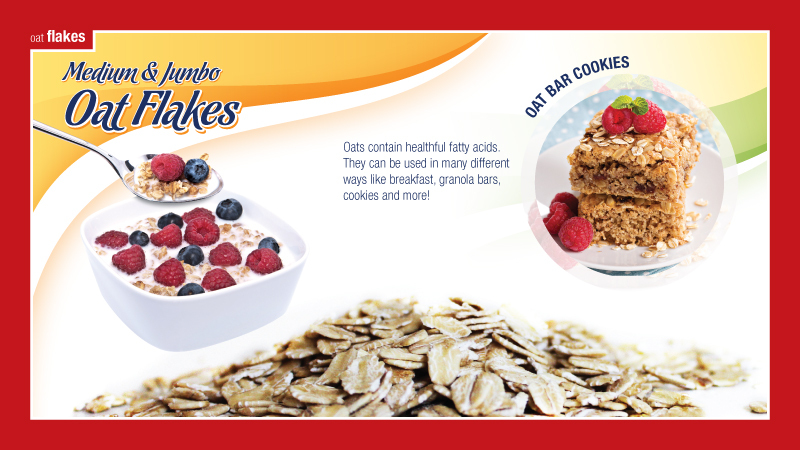 Lamb Brand Oat Flakes come in two differnet sizes: Medium Oat Flakes and Jumbo Oat Flakes. Quinoa pronounced as “keen-wah” is a tiny bead shaped seed. It comes in a rainbow of colours and can be prepared like whole grains such as rice or barley. This protein-packed seed contains every amino acid, and is particularly rich in lysine, which promotes healthy tissue growth throughout the body. Quinoa is also a good source of iron, magnesium, vitamin E, potassium, and fibre. The taste and texture of quinoa is a bit like brown rice crossed with oatmeal. It’s fluffy, creamy, crunchy and somewhat nutty, all rolled into one. Quinoa makes great breakfasts, lunches, brunches, dinners or desserts. The great thing is, it can be prepared in so many different ways, making it extremely versatile. QUINOA AND WHAT IT CAN DO FOR YOU! -it is a complete protein since it contains all essential amino acids which are great for children, athletes and adults. -a good source of calcium, manganese, magnesium, copper and lysine. All help increase bone density. -high in Riboflavin (B2), which helps improve energy metabolism and help create proper energy production. -It is so versatile that you can substitute it in a dish for rice, add it to soups, casseroles, or even use it to make a sweet breakfast porridge. Polenta is made from ground cornmeal (maize), a dish that originated in northern Italy. Lamb Brand Polenta is an instant version of the original recipe, this means that it has been partially cooked before grinding so that it only takes you 5 minutes to cook. 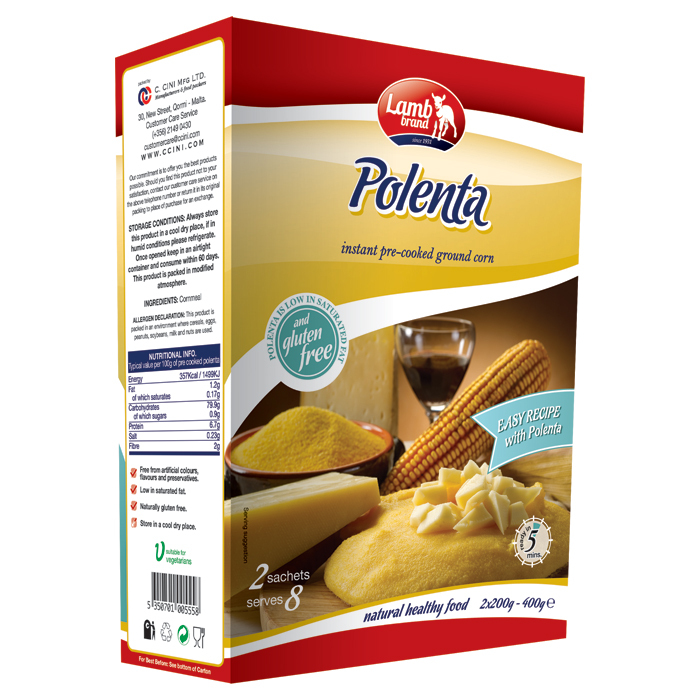 Polenta has a smooth and creamy texture and can be consumed either plain or enriched with a varied selection of ingredients. Add a simple knob of butter, grated cheese, porcini mushrooms, beans or meat. Polenta can be served as cooked, grilled or fried after it has set. Used in both savoury and sweet recipes polenta can be added to all types of food and served either hot or cold. Use Polenta as a main ingredient in pies or as a substitute for potatoes, have it grilled with some cheese as a snack or as a side during breakfast, lunch or dinner! Due to its main ingredient of cornmeal, polenta can really act as a gluten-free substitute for almost any wheat-based side dish in a meal. Though relatively plain in taste, ingredients can be added to it to make it more tasty such as butter, cheese, sauces and meat. These ingredients may lessen its potential benefits however they turn a simple side into a hearty meal. Basic Polenta is easy to do. 1. Bring 6 cups of water to a boil in a heavy large saucepan and add 2 teaspoons of salt. 2. Gradually whisk in the polenta and reduce the heat to low and cook until the mixture thickens and the polent is tender, stirring often, about 15 minutes. 3. Turn off the heat. Add the butter, and stir until melted. Click here for more information about Polenta. Bulgur is a quick-cooking form of whole wheat that has been cleaned, parboiled and dried into ground particles and later sifted into distinct sizes. Bulgur is rich in fibre, B-vitamins, iron, phosphorus and manganese. No chemicals or additives are used when processing bulgur wheat, making it a natural whole grain food. 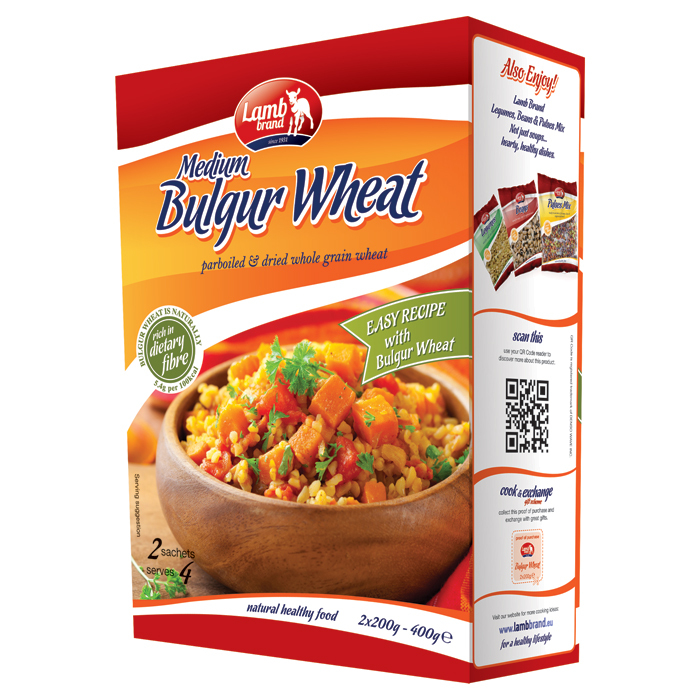 Lamb Brand Bulgur Wheat is a versatile wheat product with a pleasant nutty flavour. Use it in pilafs, soups, baked goods, stuffing or casseroles. In recipes, it is similar to rice or couscous but with a higher nutritional value. Lamb Brand Bulgur Wheat can be used just like rice or couscous, or any other whole grain, such as barley or quinoa. Instead of rice, try pairing your favourite stir-fry or curry with whole grain bulgur. Bulgur is ideal for vegetarians and vegans and makes a perfect meat alternative. Bulgur wheat is not suitable for those on a gluten-free diet. Use it as a side dish or for your main meal. Click here for more information about Bulgur Wheat. Mashed potatoes is one of the delicious ways of serving potatoes. The Lamb Brand Potato Mash is ready in minutes. A quick, tasty side with many meals, made of 99% real potatoes. Mashed potatoes have various health benefits. They are loaded with mono-unsaturated fats that are the most essential for maintaining the cholesterol levels, both the good and the bad cholesterol. Mashed Potatoes also have protein and carbohydrate content present in them. Both are crucial in maintaining the body system and overall health. Mashed potatoes are also loaded with vitamin C and potassium. Why not dress up your mashed potatoes? There are endless ideas and ways to be creative with your Potato Mash! Cook your mash Mediterranean style by adding some chopped basil, tarragon and parsley. Add some apple sauce on top of your mash to go along with a nice roast pork. Have your mash Mexican style by adding some minced seeded Jalapeno peppers for that spicy touch! For the Low fat mash potato option omit using butter and add cooking water instead. Add some non-fat plain Greek yogurt. Healthy but just as tasty! 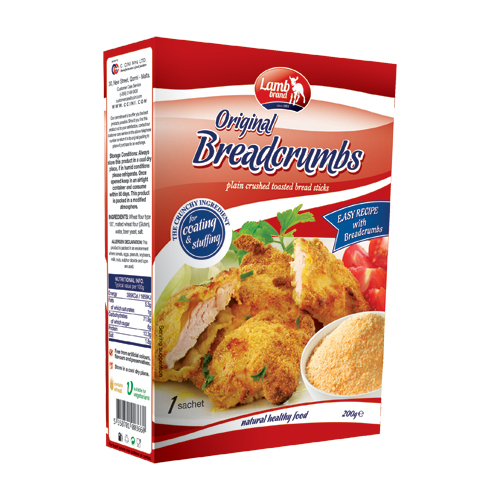 Lamb Brand breadcrumbs are small particles of dry bread, used for breading or crumbing foods, topping casseroles, stuffing poultry, thickening stews, adding inexpensive bulk to meatloaves and similar foods, and making a crisp and crunchy coating for fried foods. Breadcrumbs can be used in both sweet and savoury dishes. They are great for that added ‘crunch’ and texture in food. Why not try some homemade baked fish cakes in breadcrumbs and coat with a rich creamy sauce? The breadcrumbs will pack all the fishy goodness inside and prevent the cakes from going soggy. You can also make some crunchy potato and cheese croquettes as an accompaniment to a chicken, beef or lamb or vegetarian. Try cooking up a delicious apple pie with our Lamb Brand Breadcrumbs, an extremely popular dessert recipe. Serve it warm with some whipped cream for the full experience. Welcome to our Nature Line events page. 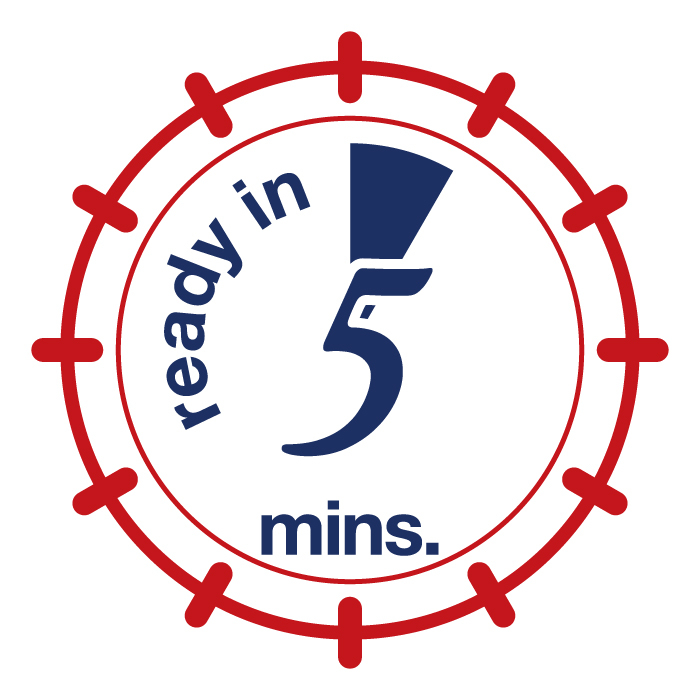 From time to time, Nature line showcases its products by sponsoring, organising and taking part in various events. We enjoy setting up exhibitions and workshops to show our clients and the market the range of products we have on offer as well as the many ways they can be used in simple day to day recipes. Couscous is a dish made from tiny granules of durum wheat and most of it is "instant" or quick-cooking.This is closely related to pasta, as durum wheat, ground into semolina flour, is the same type of wheat that is most commonly used for making pasta. It is traditionally served with meat or vegetable stew spooned over it. Couscous is a staple food throughout the North African cuisines of Morocco, Algeria, Tunisia, Mauritania, Libya and the Western Sahara, however is has become very popular in Malta in the last few years. Maltese Almond Biscuits are Maltese traditional sweets, mostly served during tea time or on special occasions. These biscuits are vegan, gluten free and with reduced sugar.